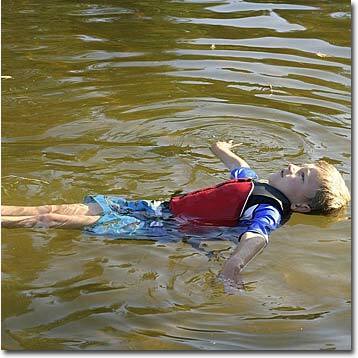 In When the PFD Fits… Wear It!, we discussed selecting, fitting and adjusting personal flotation devices, or PFDs, for adults. Now we’ll discuss how to find the right PFD for the child or youth in your life. 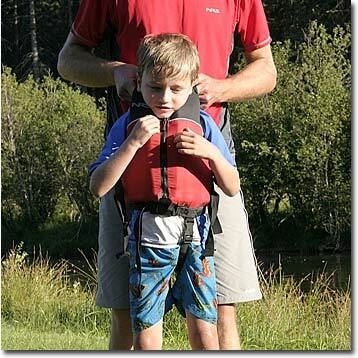 We’ll also show you how to teach your child to wear, adjust and utilize their new PFD. But before we get to the kids, let’s talk about you. 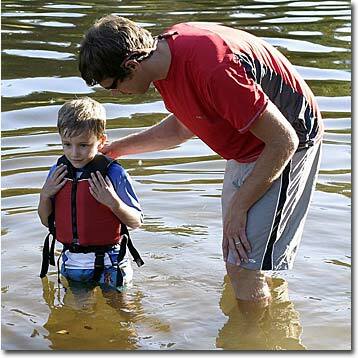 The first step toward keeping your child safe on the water is keeping yourself safe, and that means wearing your PFD. In the event of an on-the-water emergency, you won’t be able to help your child if you’re struggling to stay afloat. Besides, wearing your own life jacket demonstrates that safety is important to you. And what’s important to you will seem important to your child. 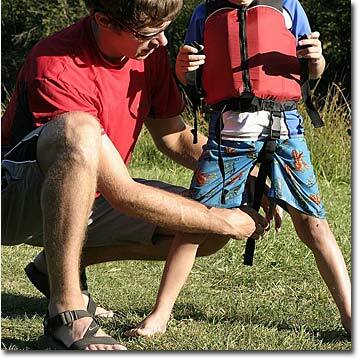 Fitting children follows the same general rule as fitting adults: a PFD should fit securely without being too tight. The term the Coast Guard uses is “comfortably snug”. If you can’t make the life jacket fit snugly, then it’s too big. If you can’t put it on your child and fasten it comfortably, then it’s too small. Notice the word “comfort” coming up a lot here? Good. Remember, the best life jacket is the one that gets worn. The more comfortable a PFD is, the easier it will be to get little Sally or Bobby to wear it. Every PFD manufacturer has its own sizing system, and it’s important to confirm sizing before purchasing any brand of life vest. 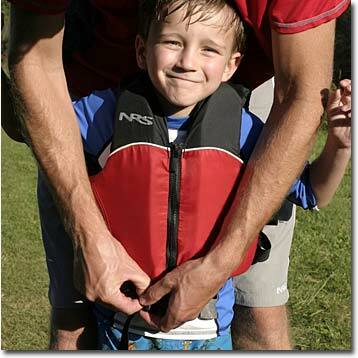 Consult the PFD manufacturer’s sizing chart to determine which size PFD your child will need. NRS life jackets are broken down into three major categories, as shown in the chart below. Where does your child fit? Chest 22" – 25" 24" – 29" 30" – 58"
For information on specific models of Infant, Child and Youth PFDs, shoot us an email or give us a call at 877-677-4327. 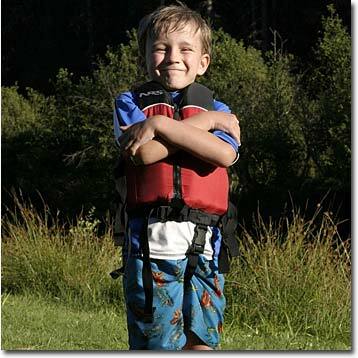 After you’ve consulted the PFD manufacturer’s sizing recommendations and selected a life jacket, have your child try it on and get used to wearing it. 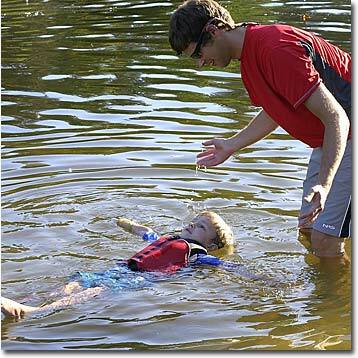 Taking the PFD along to the pool or your local swimming hole for a “dry run” provides a great opportunity to test the life jacket under controlled conditions and to teach your child how it works. 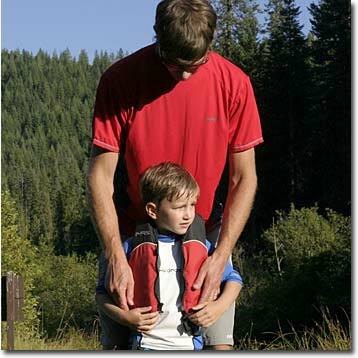 Talk your child through the process of putting on and adjusting their life vest. Show them how to fasten the zippers and/or buckles. Demonstrate how to adjust the fit the same way NRS Customer Service Representative Emily taught “Boater Alex”. Kids love to learn and feel included. Recently, Mark in NRS Marketing took his five-year-old son Henry to the river for a boater’s safety session. Here, Mark helps Henry zip up the life vest and fasten the bottom buckle. Next, he’ll show him how to tighten the adjustment straps by pulling forward on both sides at the same time, working from the bottom to the top. If your child’s PFD has leg straps, they can be adjusted to help keep the life jacket from riding up, but leg straps are no substitution for a good fit. They’re an insurance policy. The life jacket should fit snugly even without them. Be sure to test the fit by picking your child up by the shoulder straps. If the chin and ears slip through, then the PFD is too loose. Looks good! Now it’s time to get wet! Join your child in the water for a test session. 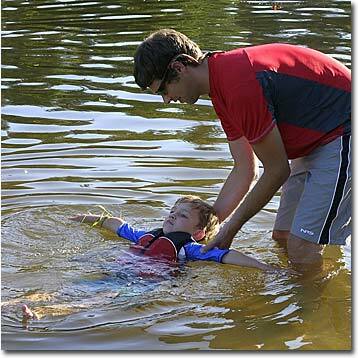 Ensure that the PFD can handle your child’s body weight and that it floats them face up. This is also a great time to practice some safety basics. Teach your child to remain calm and avoid thrashing about. Teach them how to shift their weight in the water so they’ll float comfortably face up. Show them that their life jacket will keep them afloat, that they’re safe and that you’re there to help them. When your child feels safe and confident, they’ll enjoy boating more, so you can enjoy more boating! Introducing young people to the joys of the boating world is a fine gift to give them. Just remember, their safety is in your hands. For more info and tips on keeping them safe and helping them enjoy the experience, check out these newsletter articles in the right hand column above.